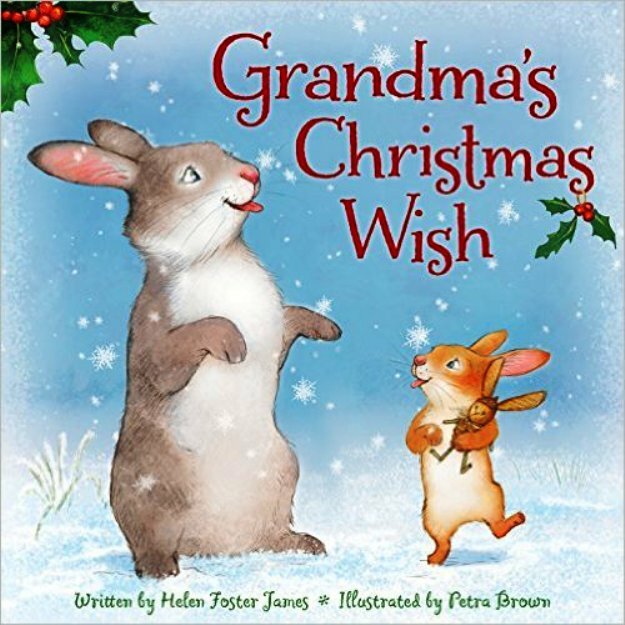 The holidays are coming, and the biggest holiday of all—Christmas—has inspired author Helen Foster James’ latest picture book, called Grandma’s Christmas Wish. 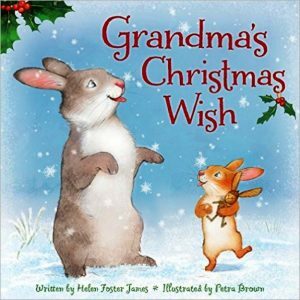 In the book, furry Grandma Rabbit tells her fluffy little grand-bunny all the reasons that it is loved. She calls it her “jingle bell baby,” her “snowflake,” her “star on the first Christmas night,” and her love. The baby never speaks; it just gazes up into grandma’s eyes with the adoration that can’t be expressed in words. Ms. James’ text is extra-brief, but every sentence drips with love. The bulk of this love story is told through artist Petra Brown’s striking illustrations, done up in a style that is strongly reminiscent of the works of the mega-talented Jerry Pinkney. Ms. Brown uses soft pastels, swirling snow flakes and soft blankets of snow to make readers feel warm and cuddly…and cold at the same time. Her scenes are brimming with detail, like when Grandma wraps her grand-bunny’s gift in lettuce leaves and covers the baby with a warm and cozy hunk of hay. This book should become a fast holiday classic, and should do well in school settings, libraries, and around the family fireplace.